It was a very hot and busy weekend at the farm. Did I mention it was HOT? BUSY???? This weekend was the annual Breyerfest convention over at the Kentucky Horse Park. Folks come from all over the country to share their love of model horses. A large number of them make it over to the farm to visit some real horses, including our own Breyer model, Bull Inthe Heather! We had “all hands on deck” this weekend. We had a booth set up over at Breyerfest to tell people about Old Friends. They sent a lot of people over to the farm to visit. Most all of the tours were big enough to split into two good-sized groups. Each tour went in opposite directions, but that means that our “official greeter and treat hound,” Afternoon Deelites, really had to work hard. He was out in the center of his paddock watching both groups heading in his direction. 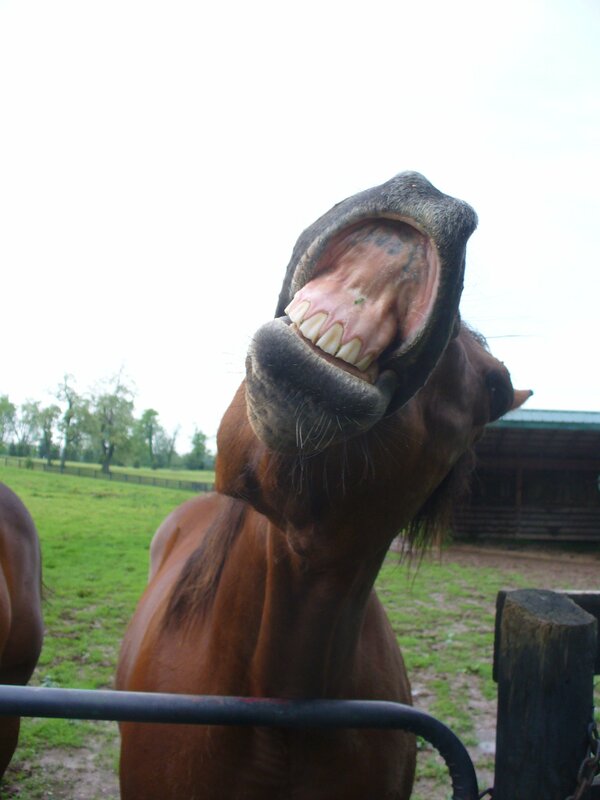 Luckily, Gulch was also in a mood to greet every tour for treats, so Afternoon Deelites didn’t have to work as hard. He was racing back and forth all day long making sure he got more than his share of carrots from each tour. Even while working one group, you could tell he had an eye on the group across the way. I have a feeling he burned off a lot of his carrots just racing around to make sure he got them all! 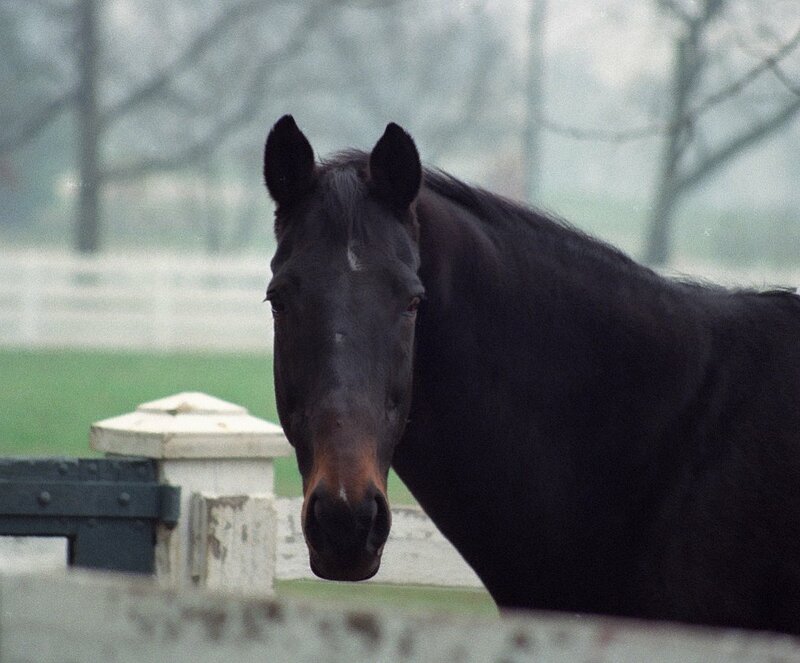 Several eagle-eyed Breyerfest girls noticed the grave for our Black Tie Affair and kept asking about him. After a little research on one of the dad’s phones, it turns out that Breyer created a model called TS Black Tie Affair a few years ago for an Arabian pinto that had the same name as our Blackie. In the office, Desi the cat was really enjoying being the center of attention. He had no problem with plopping down in the center of the crowd and getting petted. It’s hard to believe that he used to run for the basement at the first sign of any people. At one point between the 1:00 and 3:00 tours on Saturday, the office was empty and Desi was sitting in the middle of the floor just glaring at the door. I think he was trying to will people to come in the office to pet HIM. After all, that’s why people come to Old Friends, right? By the time the 3:00 tour rolled around on Sunday, everyone was pretty much exhausted. On the last tour was a couple, Jimmy and Suzie, who knew a whole lot about racing. Jimmy got his photo taken with The Name’s Jimmy. As the tour progressed, he was remembering the trainers of a lot of the east coast horses as we visited them–Sunshine Forever, Kiri’s Clown… It turns out he’s spent most of his life on the racetrack galloping horses. As the tour was winding down and the kids were racing Little Silver Charm around his paddock, we got to talking about favorite horses. 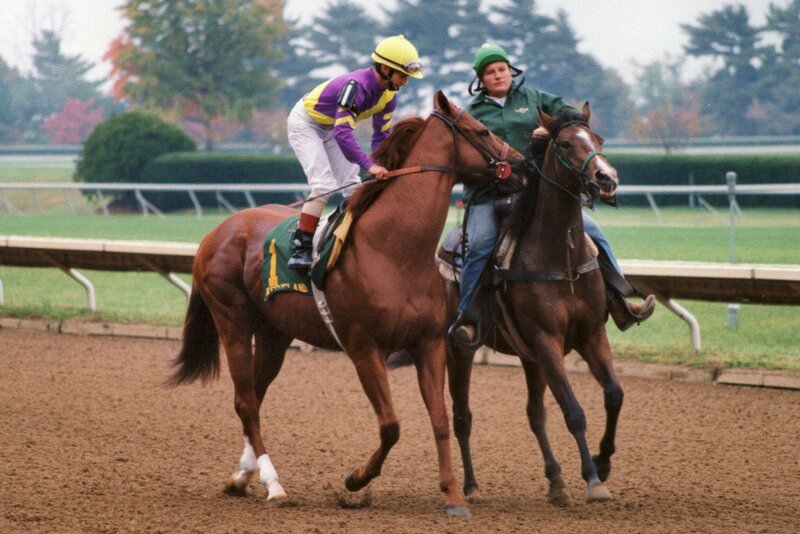 Since Forego was the horse that dragged me into racing as a child, I mentioned him. It turns out Jimmy galloped him the last two years he was racing! So — I got Forego stories from someone who knew the young Forego on the track. I only got to know him during his later years when he had, um, mellowed a bit. After the tour was over, we were still talking the old days of racing along with Viv, who had stopped by after spending all weekend over at Breyerfest with Bea. Jimmy couldn’t believe we had Commentator and Tinner’s Way, so the next thing you know, we were off on an early evening adventure to the back of the farm. Tator was being his usual Tator self and paced up the hill alongside the golf cart. Tinner was right at the fence watching us and was very happy to have some company. It turns out Suzie does massage on horses and she started right in on Tinner, who just sighed and let her work on him. Meanwhile, Jimmy was petting him and handing over carrots. All of a sudden, Tinner lifted his head and just wandered out into his paddock. He had a drink and started grazing. Not sure why. So, we headed over to Tator who was watching us quite closely. Carrots for Tator while he accepted a bit of massage, too. We were just about done with the Tator, when we heard a huffing and puffing from Tinner’s paddock and he was right back over at the fence, placing himself in position for more massage. Suzie went back over to Tinner and he just melted under her hands working on him. He dropped his head and just sighed. He didn’t walk away this time. As we headed back down the hill, Swannie suddenly decided to quit ignoring us and raced over to the fence for some carrots. Then Tator charged over, as well, since he really hadn’t gotten his fair share of carrots–at least, according to Tator, he hadn’t. We made one more brief stop to see Ogygian, who was also remembered. Luckily, we still had a few carrots for O and he even got a little mini-massage. Finally, Breyerfest weekend at Old Friends was drawing to a close. I think a good time was had by all. This Saturday’s highlight was Samantha Siegel’s visit to the farm to see Arson Squad! Samantha, of Jay Em Ess Stable, raced Arson Squad. When a training accident at Gulfstream Park ended the millionaire gelding’s racing career, she gave him a future. 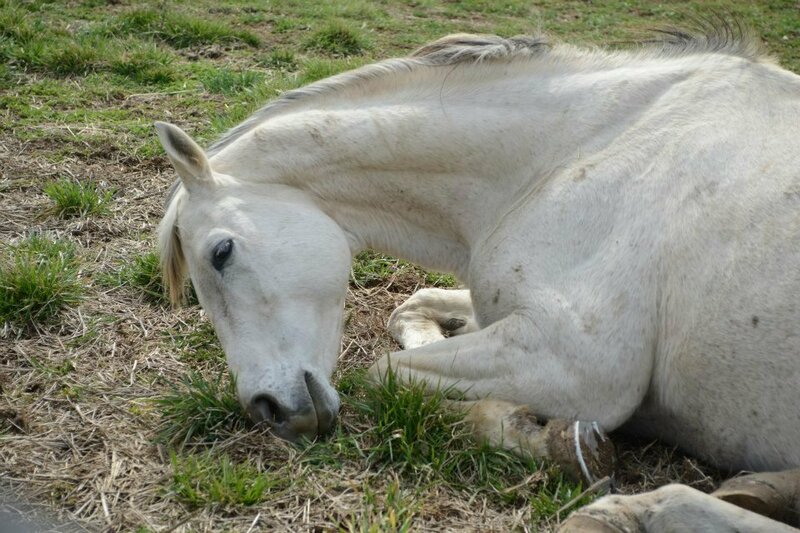 Thanks to her, Arson’s fractured leg and torn ligament were literally put back together again by Dr. Larry Bramlage and he got Rood & Riddle Equine Hospital’s special care until he was ready for retirement to Old Friends. We’re overjoyed that Arson could show Samantha how much he’s enjoying the life she made possible for him. Of course, both Little Silver Charm and Afternoon Deelites were each convinced that our guest of honor had come only to see him. Arson isn’t the only resident who’s had a reunion. Last Saturday Miles Dunne, Commentator’s exercise rider, stopped by to visit him. 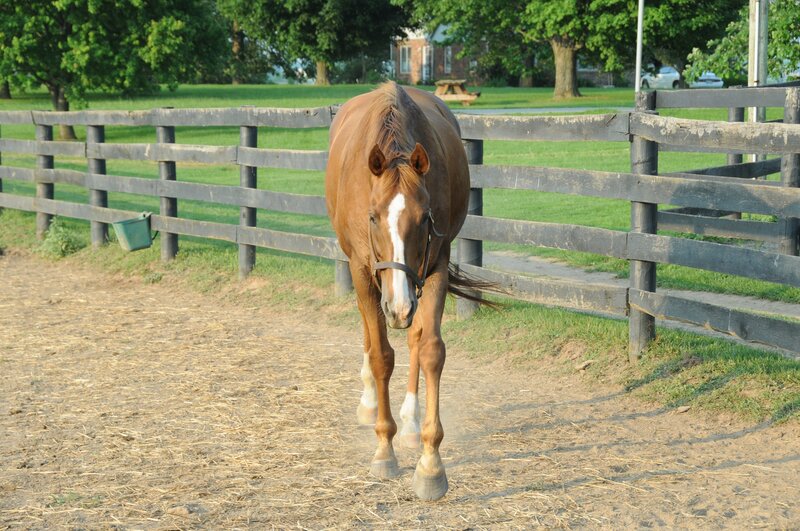 We’re so pleased that Miles promised to drop by on his old buddy again when his busy schedule brings him to Kentucky! The horses most definitely do remember people who were important to them, and often they visibly enjoy visits from people in their past. Danthebluegrassman was especially affectionate this Saturday. And especially lucky. During a tour some kids had fun rolling pieces of carrot under the fence for him to find and eat. Flick did not seem much impressed. Sunshine Forever also enjoyed some lazy summer afternoon petting from his visitors. He had an important anniversary last week. 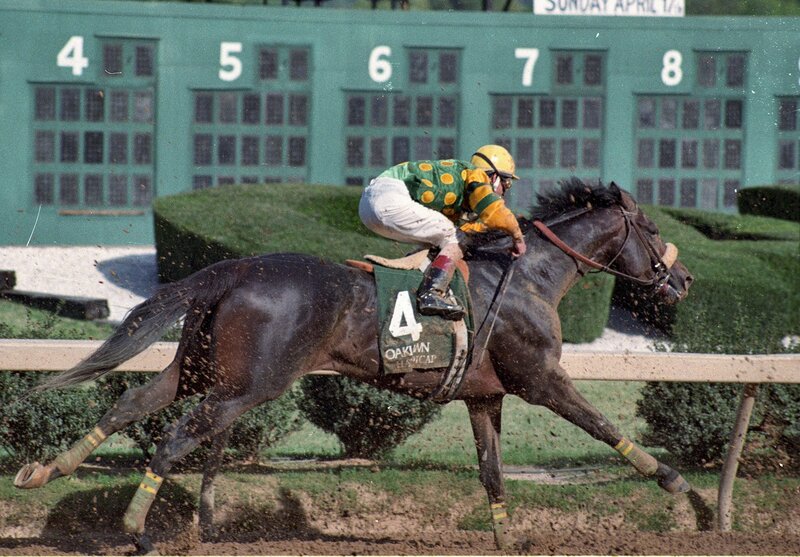 25 years ago he won the Lexington Stakes (G2) at Belmont, soaring into the series of magnificent performances that earned him the 1988 Eclipse Championship on the turf. Not that he seemed to be thinking about the past. In his infinite wisdom, Sunshine knows how to relax and enjoy each day—maybe he’s better at that than any other horse on the farm. He remains remarkably young for his age, as beautiful as ever, just a little more laid back and more gracious with each year that goes by. Next weekend is BreyerFest! Old Friends loves our visitors who come over from the model horse festival, which is held annually at the Kentucky Horse Park. Breyerfest is a huge event around here, and one of our favorites, since many Breyer model collectors find time to come share their love of horses with our residents. Of course, Ferdinand’s son Bull Inthe Heather will be on hand to greet collectors of the Bull Inthe Heather model, Breyer’s creation to benefit the Old Friends retirees, and 100% of the profits from the model Bull Inthe Heather sold in our wonderful gift shop go to support Old Friends (sorry folks, the real Bully’s not for sale!). The Old Friends table will be at BreyerFest as usual, so do look for us there and come see us at the farm and check out the new items in the gift shop. We’re just a few minutes from the Horse Park. Danthebluegrassman ready to love or mooch.